Netflix announced today, out of this year's Toronto International Film Festival, that it has acquired worldwide rights to director Chris Smith's fascinating deep dive into actor Jim Carrey's time spent portraying famed and complicated comedian Andy Kaufman. Using approximately 100 hours of footage shot on the set of Man on the Moon documenting Carrey's transformation into Kaufman for four months. The VICE Documentary Films production premiered at the 2017 Venice Film Festival and is produced by Academy Award winner Spike Jonze, and VICE Films' Danny Gabai and Brendan Fitzgerald. In 1999 Milos Forman cast Jim Carrey to play cult comedian Andy Kaufman in his biopic Man on the Moon. What followed was an intensely bizarre and emotional film production. Surrounded by Kaufman's friends and family on set, Carrey thoroughly "became" Andy and, alternately, Tony Clifton, Kaufman's obnoxious lounge singer alter ego. Much like Kaufman's comedy, Carrey's acting took on a performance art quality during the film. He never broke character on set, the cast and the crew referred to him as either 'Andy' or 'Tony' depending on who he was embodying (he had created complete and separate identities for each). Here's what Lisa Nishimura, VP of Original Documentaries for Netflix, had to say in a statement. 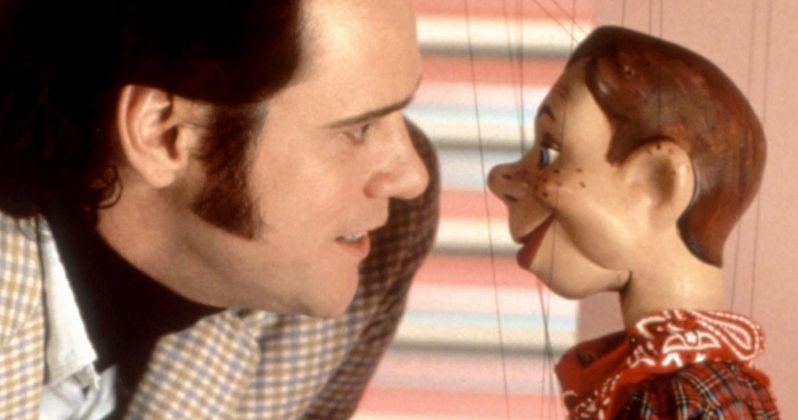 "For almost two decades this brilliant performance from Jim Carrey has resonated with audiences and fans of Kaufman's, but the story behind the film, a true piece of entertainment history has remained largely unknown. Chris Smith and Spike Jonze have masterfully unearthed and explored Jim's complex and artful creative process, hurling audiences right into the mind of a genius." Jim Carrey earned critical acclaim and a Golden Globe for the performance, but many of the production's most Kaufmanesque moments played out behind the scenes, thankfully captured on video by Andy's former girlfriend, Lynne Margulies and former writing partner, Bob Zmuda. In Jim & Andy, Carrey looks back at the resulting footage 18 years later, reflecting on how he and Andy came up in oddly parallel universes, his experience channelling Andy and Tony and more broadly the spiritual journey of his career. Here's what Danny Gabai, Executive Creative Director, VICE, had to say in his statement. "VICE is always focused on telling stories you can't see anywhere else, and Chris' film is an incredibly humanistic deep-dive into the mind of a brilliant artist. Chris, Spike and Jim have made a film that makes us question what we really want in the world, and we couldn't be more excited that Netflix is bringing it to the world." Jim & Andy: The Great Beyond - Featuring a Very Special, Contractually Obligated Mention of Tony Clifton is produced by VICE Documentary Films, the feature-length documentary division from VICE Media. The film is produced by Spike Jonze, Danny Gabai, Brendan Fitzgerald. Executive Producers are Eddy Moretti, Shane Smith, Tony Clifton, Michael Kronish, Jim Czarnecki, and Nicole Montez. No release date has been given for this Jim & Andy documentary, but that announcement may be coming soon. Hopefully we'll Netflix will release a trailer soon while we wait for word on its release date.